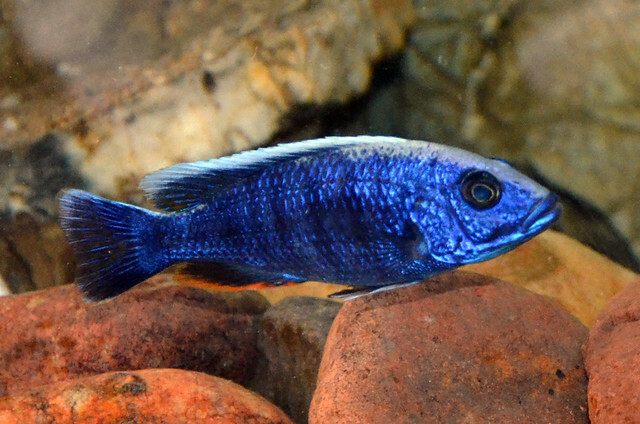 The Electric Blue cichlid [electric blue hap (Sciaenochromis fryeri)] is a popular fish among hobby aquarists because it is an overall easy breed to care for and an easy species to breed. People also find their vibrant colors pleasing to the eye. In addition, they are not known to be picky eaters. However, they do ask for good water conditions, with suitable aquarium decorations. Setting up an aquarium for an Electric Blue cichlid is simple, but takes thought and perhaps some research. It is important to try to replicate their natural environments to the best of your ability. Electric Blue cichlids are native to an African Rift Lake named Lake Malawi. In their natural habitat, they depend on their own instincts for their survival by hiding in rocks and logs, searching for smaller fish to eat. In an aquarium, an Electric Blue cichlid totally relies on his owner for his survival and well-being. By providing for your fish, a home that closely resembles his native home, you will increase his lifespan, as well as cut down on aggressive behavior. You can also train your cichlid to eat prepared food rather than smaller fish in your aquarium. The other option is to keep your Electric Blue only with fish are as large, or larger, than they are. They will be safe from your cichlid's bite. An Electric Blue cichlid can grow to be 6 inches in length, therefore should be put in a larger tank. A 55-gallon tank is the smallest tank you would want to house your Electric Blue cichlid in. They can live in murky water, but most hobby aquarists prefer to have their tanks clear. The fish do not mind clear water, either. The water should be kept at temperature ranges of 72 to 82 degrees Fahrenheit. This is very important because having the incorrect water temperature is one reason why cichlids become aggressive. They are hardy fish, but any drastic change in water temperature could have detrimental effects. Keep the aquarium out of direct sunlight, and away from all heat sources to prevent sudden a rise or fall of water temperature. Finally, an Electric Blue cichlid likes to have plenty of places he can hide, yet also have plenty of swimming space. Rocks and wood can be stacked strategically along the bottom of your tank to accomplish this. You will also want to replicate the substrate from Lake Malawi because these cichlids like to play in the substrate sometimes. Having the incorrect bottom layer in your aquarium can harm them unnecessarily. Electric blue cichlids are extremely beautiful fishes and are stupendous in freshwater aquarium keeping. They possess the typical shape of the cichlidae family which is sleek and bullet shaped body. The other name of a blue cichlid is Sciaenochromis fryeri, which can be placed in the aquarium together with other Lake Malawi cichlids if given sufficient and capacious tank of about 70 gallons or even more if possible and decorate it with plenty of rockwork. Live plants are not very compatible with blue cichlids because of its excessive aggressiveness and agility. However, aquatic plants may be beneficial to other aquarium inhabitants. Electric blue cichlids larger than three inches have the tendency to uproot any plants and may be aggressive towards small fishes. They are originally found in the Northern end of Africa and are considered as an "old species" because of its wide distribution in lakes and its breeding technique. Most of the blue cichlids caught are from Likoma. The natural habitat of a cichlid is deep water over rocky areas. They can grow as much as 20 centimeters. They are considered as a mouth brooder fish. The female electric blue cichlid will fertilized and carry its eggs in her mouth within the period of twelve to eighteen days, after that the fry are released. The female can spawn up to 50 - 60 eggs or a maximum of 100 eggs. Spawning is normally done in flat rocks or surface in the wild but in aquarium the males are the ones who make the nest. These variety thrive well in an aquarium water chemistry of 72 - 82 degrees Fahrenheit with a pH level of 7.8 -8.5 and dH of 10 - 15. The temperature may range from 25 - 28 degrees Celsius. Appropriate tank size would be a minimum of 4 - 6 inches in length. The adequate ratio for cichlids inside the tank is one male to five or 7 female blue cichlid. In the wild this fishes mainly feed in the fry of other species but when kept in aquariums the proper way to provide food is once or twice a day. Each meal should only be given the amount that may be consumed within five minutes. It is best to feed them with live foods like feeder gruppies as well as commercial meaty foods such as freeze-dried or frozen blood worms or brine shrimp. More so, supplement live foods with pellets. Bear in mind that pellets are only supplements to their staple food and should not be fed as their primary diet. Breeding electric blue cichlid is easy as long as it is provided with the proper care and diet. Read more about how to breed this variety of cichlid, it can be rewarding in your part. Lacey Bryant is a cichlid enthusiast.